Want to put a smile on the face of the wine lover or friend in your life? Look no further! FOLE'S fuzzy wine socks comes in 4 adorable colors. We offer the sassy sock's colors in Frosted White, Purple Persuasion, Pink me Now,and Unicorn Blue. Get this comfortable socks with a bonus silicone wine stopper to keep your bottle of wine from unwanted spills and keeps your wine from volatilizing. The food grade silicone stopper is the cherry on top. So comfortable you won't want to take them off. Made with high quality material with Anti-Slip Rubber. Made with extra fluffiness, soft to the touch and Non-slip fuzzy wine socks will reduce the chance of your wine lover stumbling! Wear FOLE's socks around your house comfortably without falling down. Perfect for weekend lounging and wine on demand! Perfect wine gift to keep your spouse at call, keep yourself comfy without lifting a finger and your wine glass full! Show your feet some love by wearing the super comfortable socks. Whether this gift is for you, friends, or a family member, these socks are unique and will definitely stand out. We designed the socks to make sure they make a statement. Amazing gift for any Occasion. Get the socks for your wife, sister, co-worker or any wine enthusiast. They make a perfect housewarming, secret Santa, anniversary, engagement, bridal shower, white elephant, or wedding present. Bundle them with a bottle of wine or chocolate and you have an amazing unique gift she will love! One size fits most. Your satisfaction is our top priority. FOLE's fuzzy wine socks are backed by 100% guarantee. If you're not satisfied with our product, we'll happily give your money back. Try FOLE's "IF YOU CAN READ THIS BRING ME SOME WINE" socks once and you'll quickly purchases another to gift your friends or family. ❤PERFECT FOR WINE LOVERS- The perfect socks to keep feet your feet warm and cozy along with a bonus thick cotton drawstring bag. Choose from our 2 unique adorable colors, Frosted Cherry and Purple Persuasion. 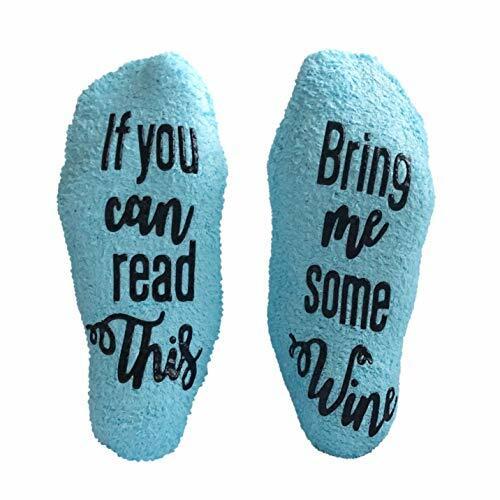 These message in the socks are sassy, will keep your wine glass full and never empty, and will bring happy smiles to your wine enthusiastic. ❤AMAZING GIFTS WITH BONUS PACKAGING - Elegantly packaged in a stylish and beautiful eco-friendly packaging, ready for gifting to wine enthusiasts, wine lovers, hostess, wife and everyone with a good sense of humor. Our socks come with "Drink Me" food grade wine stopper. Keeps unwanted spills and keeps your wine from unwanted spills and keeps your wine from volatilizing. ❤SO COMFORTABLE SHE WON'T WANT TO TAKE THEM OFF - Made with high quality super comfortable material with Anti-Slip Rubber. Made with extra fluffiness, soft to the touch and Non-slip fuzzy wine socks will reduce the chance of your wine lover stumbling! ❤UNIQUE GIFT FIT FOR ANY OCCASION - No matter what the occasion, our vibrant wine socks will be a hit! Get them for your wife, sister, co-worker or any wine enthusiasts. They make a best housewarming, secret Santa, anniversary, engagement, bridal shower, white elephant, or wedding present. Bundle them with a bottle of wine or chocolate and you have an amazing unique gift she will love! One size fits most. ❤100% MONEY BACK GUARANTEE- If you're not satisfied with our product, we'll happily give your money back. Try FOLE's "IF YOU CAN READ THIS BRING ME SOME WINE" socks once and you'll quickly purchases another to gift your friends or family.